During our most recent forecast release, the discussion with the Legislature turned to the topic of trends in public sector employment both from a near-term perspective and from a long-term viewpoint. My comments were along the lines that the public sector did not see nearly the same level of job losses as the private sector in recent years but from a per capita basis we are currently at levels not seen in quite some time and we are losing public sector jobs in recent months and years. To fact check myself and to better understand the relative size of government, at least in employment terms, I put together the following facts and figures. 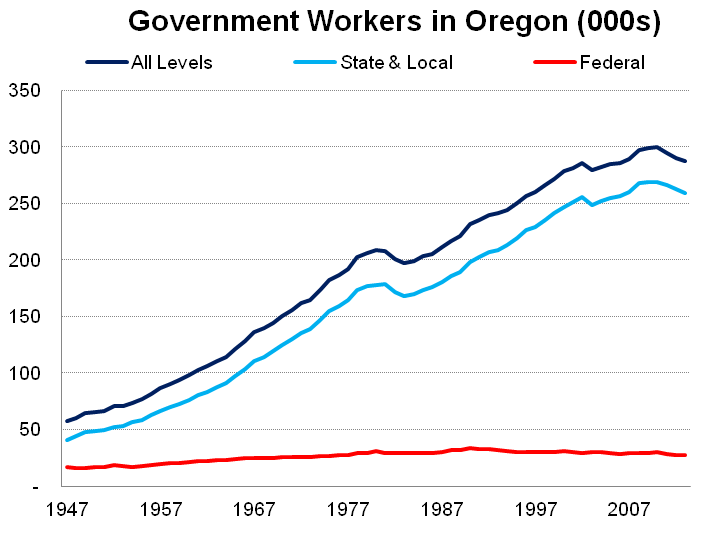 Government employment in Oregon has generally been increasing over time, particularly among state and local governments. Since World War II there have only been three period when state and local employment fell outright in Oregon and are associated with very tough economic conditions in the state (and subsequent public sector budget cuts as revenue falls). These periods are the early 1980s following the devastating recession, after the dotcom recession (and voting down of Measure 28), and today in the aftermath of the Great Recession. See here for more on the nature of the public sector changes in recent years. While public employment has generally been increasing over time, once you adjust this employment based on population or the size of the economy, it has been pretty steady since the 1970s or so. One reason to show public employment on a per capita basis is that the demand for public services generally grows in-line with population. Now, the costs of providing those services does not not grow at the same rate of population, but the demand generally does. (At least this is how we model public sector employment in our outlook.) The second graph comes from the Employment Department and what it shows is that public employment is more stable over time so the ratio falls in recession as private losses mount but rises in expansions. As for the nature of public sector employment, I break out the education-related work and then all other. Since the Baby Boomers reached their college years in the 1970s, education workers per capita in Oregon have been fairly stable, but on an ever-so-slight downward trajectory. 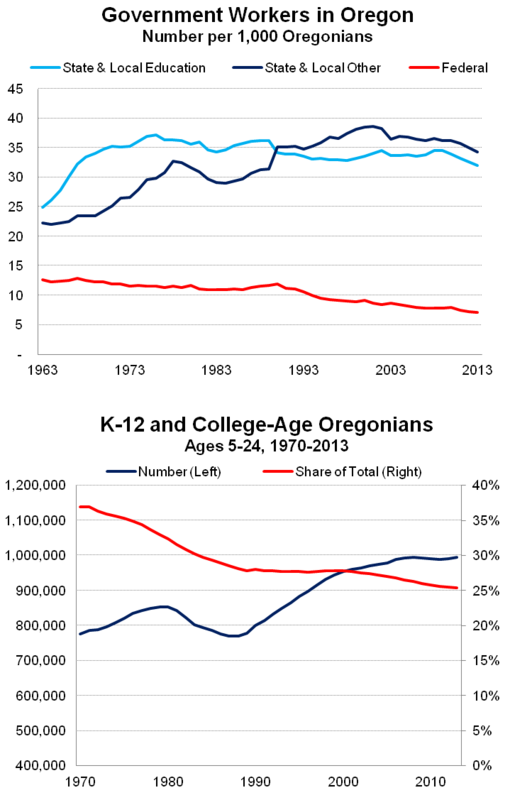 This largely follows the fact that as a share of the overall population, K-12 and college age Oregonians are a smaller share of the state, even if their outright numbers are at an all-time high. Along with an aging population (and lackluster economy over the past decade) comes a different set of demands from citizens, with a larger focus today on health care, job training and safety net programs. As such, the number of public workers in non-education (the “other”) has risen since the 1960s and 1970s. Note that the large jump in 1990 reflects the reclassification of home health care workers into the public sector (while this change occurred in 2005, the data was revised back to 1990 but not years prior to then). Another factor influencing the other state and local workforce is tribal employment, which is classified as local government. 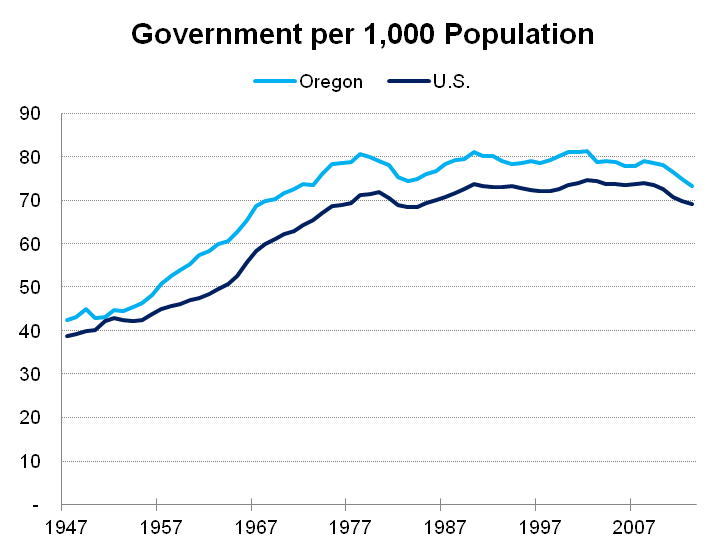 Finally, when comparing Oregon with the nation overall, Oregon does tend to have a bit more government workers per capita than the average state. 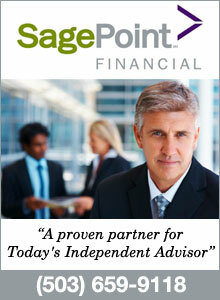 What is interesting is that the nature of this relatively larger public sector has changed over time. Up until the 1990s Oregon had more education workers per capita, however since then Oregon has more non-education workers and an average number of education ones. As for the larger non-education workforce per capita, the reclassification of the home health care workers plus the larger tribal employment in the state does account for some of the gap, although as shown in the Employment Department’s ratio graph above, Oregon does have a bit more public jobs relative to private jobs. This post was designed to just illustrate the relative size of the public sector in employment terms. As for what is the appropriate or right size and scope of the public sector, that is an ongoing political discussion that we, as citizens, get to vote on on a regular basis. Oregon state’s relatively high income tax makes government work more attractive than otherwise, too. Government salaries and wages tend to be near par with private sector salaries and wages. But government also has relatively rich healthcare plans and retirement contributions, both of which go untaxed. 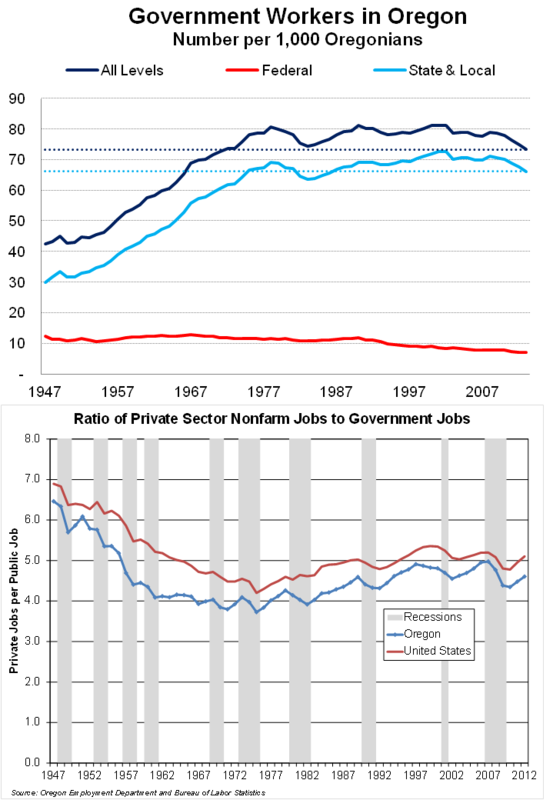 Then there’s the job security of government work relative to the private sector. So, Oregonians do manage their behavior with the state’s relatively high income tax rate in mind. Maybe this is why Oregon’s per capita income, even among “white” collar professions, is growing slower than in states such as Washington with no income tax.